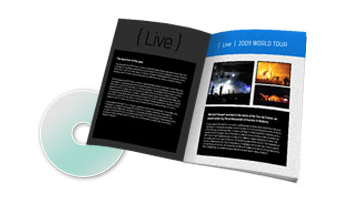 DVD booklet inserts can provide important supplemental information to your DVD and help create a superior presentation. Our DVD booklets are printed on 100lb and 80 lb. gloss bookweight paper for a quality look and feel. We can print DVD booklets for you of varying lengths, anywhere between 8-96 pages. We offer DVD booklet printing in full color so you can use photography, artwork, or color design elements throughout the insert. The finished booklets measure 4.75" x 7.25" folded and stapled and come with a self-cover. We offer fast turnaround times including next business day, 3 days, and 4 days. The price of this product includes folding and stitching (stapling). Whether you’re a business, non-profit, or career professional, you can benefit from packaging your video with our DVD booklets. Technology allows almost anyone to be a filmmaker these days, and has made video a prime marketing tool for many businesses. You can make your marketing video stand above the pack with DVD booklet printing. How you use the booklet depends on your goals. For businesses, this is your opportunity to deliver a lasting sales pitch. You should include the types of details that might not be easily conveyed visually on the DVD itself. Also, print any type of detail that you want your prospective customer to access quickly, such as your contact information. If you do not want to list rate information, consider telling customers where they can find the most up-to-date pricing. If you are a non-profit organization, a DVD booklet is a great place to include a donation appeal. If the DVD is intended for current donors, the booklet is a place to print acknowledgements, such as a thank you letter on the inside cover or first page and a full list of donor names. The back page is a good place to list the different ways to donate.